As Biogen Inc. prepares to kick off earnings season Tuesday for a beaten-down large-cap biotechnology sector, investors won’t be too focused on the financial results. The reason? The bigger catalyst for the stock is coming Wednesday when new Alzheimer’s drug data will be presented at an industry conference. Investors should prepare for a “wild ride” with volatility surrounding the presentation, according to Leerink analyst Geoffrey Porges. “We are hesitant to recommend Biogen’s stock ahead of the upcoming data,” Porges wrote in a note to clients last week. While the shares could climb by about $40 -- roughly 11 percent -- if the results are positive, an underwhelming presentation could erase most of the stock’s recent $60 gain, he said. The “number one question” this week for Biogen’s experimental drug, BAN2401, will be the size of its effect on the ADCOMS (Alzheimer’s Disease Composite Score) study endpoint, Mizuho’s Salim Syed said in a note. While a 15 percent benefit will be considered “fundamentally good,” Mizuho’s buy-side survey suggests investors may want to see a 20 percent improvement. The results are key for Biogen as they provide read-across to aducanumab, another Alzheimer’s drug in development that analysts expect will become a blockbuster. The Cambridge, Massachusetts-based company’s shares soared 20 percent on July 6 when the company and its Japanese partner Eisai Co. said the disease progressed more slowly in patients taking the highest dose of BAN2401. 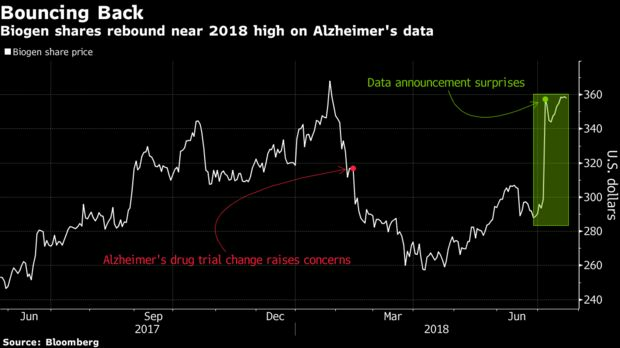 The presentation at the Alzheimer’s Association International Conference in Chicago “has become the key focus for Biogen investors” as the second-half of the year looks “otherwise tepid” in terms of catalysts, said Bloomberg Intelligence analyst Asthika Goonewardene. Earnings season has lost some of its luster for large-cap biotech stocks as failed drug trials have eroded sentiment and analysts covering the stocks don’t expect a resurgence in the second half of the year. 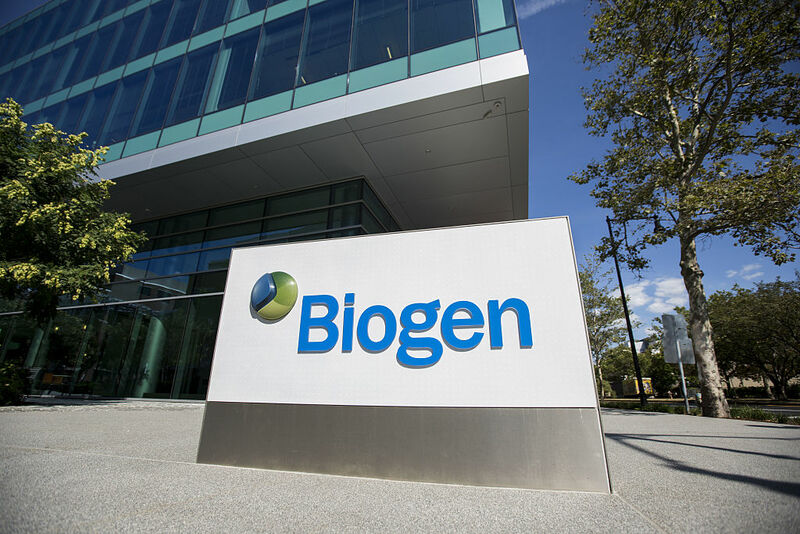 When Biogen reports Tuesday morning, investors will be focused primarily on Spinraza, a relatively new drug that treats a rare form of spinal muscular atrophy. The medicine accounted for just over 1/10 of revenue last quarter, but it’s considered a key part of Biogen’s strategy to replace lost sales as older products face increasing competition. Biogen shares fell 0.3 percent at 11:45 a.m. in New York. The stock has risen 43 percent from April’s bottom. Options expiring July 27 are pricing in a 7.7 percent move around earnings and the BAN2401 presentation, according to data compiled by Bloomberg. That’s more than double the stock’s average move around earnings.